this is the first time i felt so bad rejecting money. i helped a guest with her luggage to the lobby, was talking to her about what she did at STB, and after i handed over her luggages to the bellman she decided to give me a tip. i gently rejected her kind gesture, but she then looked kinda upset. i guess i understand why. argh still feeling quite bad about this. ALL was well-done until the last step. ARGH. bad day for the guest is a big NO NO. i guess she will just spread to her colleague how proud singaporeans are. dbsk songs are not easy to sing. 2 days of 200 over arrivals each at my hotel is draining me. i feel like a robot standing at the counter doing check-ins. Sheena and Nichole (!!!!) visited me at the hotel today. really happy to see nichole again after nearly 2 years! she was astonished that we are year 5s already. ACCEPT it my dear friend. 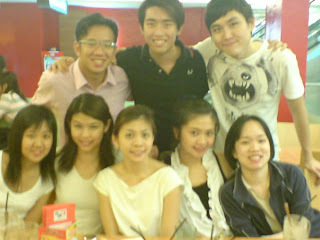 WE ARE OLD..... eh yes friends, we shall organise a class outing SOON! shall elaborate later on tonight. 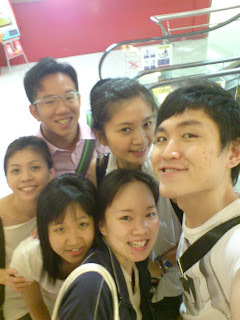 went to lai thai at thomson plaza food court for thai food with yy, dan, mel, bran, samuel and andy. the food's still as good as the last time i went there with chorale peeps. had prawn cake, lemon grass chicken, pandan leave chicken, chilli fish, prawns in sweet sauce, tom yam soup and pineapple rice. heehee each of us spent about 12 dollars each on quality food. after which we went to a nearby kopi place to talk about net force, why-we-won't-fly-off-a-moving-train-when-we-jump, army (much less now!) and what's going to happen on sat. heeehee will be able to get the stream so 7 ppl can fit nicely inside! heehee dunno what's going to happsen when joel joins us in the evening though. had a presentation for our individual groups at chorale yest. like what my other friends had said we need to make the sound brighter, and also to get better coordination for the tempo and notes. ermmmm okay i just reminded myself that i need to do the intepretation and the dynamics for suzanne! blah. and let's not forget about our abysmal seaside rendezvous. Ha! right after that we had discussion for the equal voices group. we settled on zhi hong's ave maria after we went down to his shop at bras basah to try it out. hmmm so everyone was there happily singing and talking, but a few of us (daifeng, valmond and i) were disgustingly hungry so we decided to be anti-social and headed to raffles city for dear FOOD. had lots to eat at the pizza place and the 2 of them went to get even more food at chippy's. after the feast i had mango bubble tea. couldn't sleep until 12 because of the full stomach. few things running around in my mind now. work - since jocasta gave me such good reviews i think i would be extending till july. herman would have left by june so i am the only june baby to keep alicia company. group 1 - prac was gooood. we managed to dbsk some of the dbsk song. didn't know we can make dbsk a verb...hmmm anyway irvin has a new nickname called mr-intelligent. ask him WHY. ah i think i am back. went with shihui to ocean butterfly/music forest just now to register for the class. it's always a taxing affair to start blogging a day's events and thots. as ben was sending gabriel and i home, i felt really secured and comfortable. i guess there is this sense of belonging after 8 years of singing together. we have sooo many common songs to sing together, and we never get sick of them. all night all day, one song, cantate domino, full fathom five, the songs from big river and aladdin...the feelings that was kept in the heart for some time seemed to have rushed back to my mind. HA! i just didn't feel like getting off the car, wishing for it to last maybe 2 or 3 hours more. jianhao is using less 'HAHA's. wanted to ask my friends if they are still interested in going to japan once again, but i guess after discussing with yy EVERYONE will just say 'HUH?! ', so let's just forget it. ARGH there's this rashness inside me to hope on a flight to tokyo now. HELP ME. jianhao is a very lousy perfectionist. and once again, he needs aircon for somemore. tell him more cold jokes. got many things to do. been eating and playing my salary away! thomas took so long to close the cashier earlier on this afternoon. so we were actually one hour late to meet those ppl on off and those who resigned already. went out with reception peeps to purvis street's mind cafe, where fran's friend bee kwee works at. 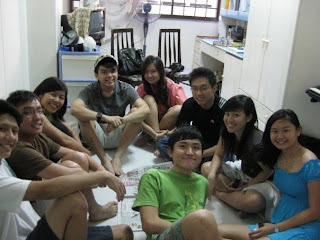 we ate alot and played alot of new games like the dinosaur-bones-snatching (heart attack) and the animal farm. i think we laughed so much until we all peng-ed. yah so there were jocasta, eugene, alicia, belinda, irene, xiuqi, herman and i. thomas pangsay-ed us at the last minute and went out with his friend at orchard. tsk tsk tsk tsk tsk. ok after that we went to nydc at bugis junction and i had the irish cream elephancino! hhahaha ooo very good until the last drop. some of them had the lemon shivers which was sooooooo sweet. hahhaah. they made me eat the leftover apple crumble with tobasco and cheese on it. i then made alicia eat her share too. anyway we kept making fun of herman and belinda cuz there are really looked very compatible! hahahah it was a really fulfilling day. we should have more of this! had group 1's practice at my house on thur. sooo many ppl turned up to have my vanilla ice cream mixed with famous amos and julie's choco sandwich. 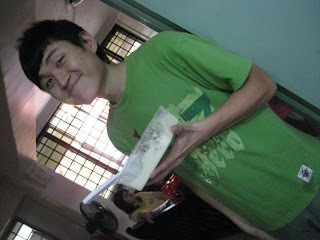 oh wei kiat and siying crashed the 'party' too and they were so nice to bring blender to make milk shake for everyone. ahahhahah oh we did well i guess. just need to work more on the dynamics and phrasings. i think the notes are more or less correct. just need to fine-tune here and there a little more. heehee we then went for dinner at crazy ang-moh. the ang moh boss was really friendly and started to talk to marie about his ambition of opening more stalls in singapore. hahahaha.